I guess that I have to face it – summer is almost at an end and fall is just around the corner. I’m ready, but I’m not ready. Know what I mean? 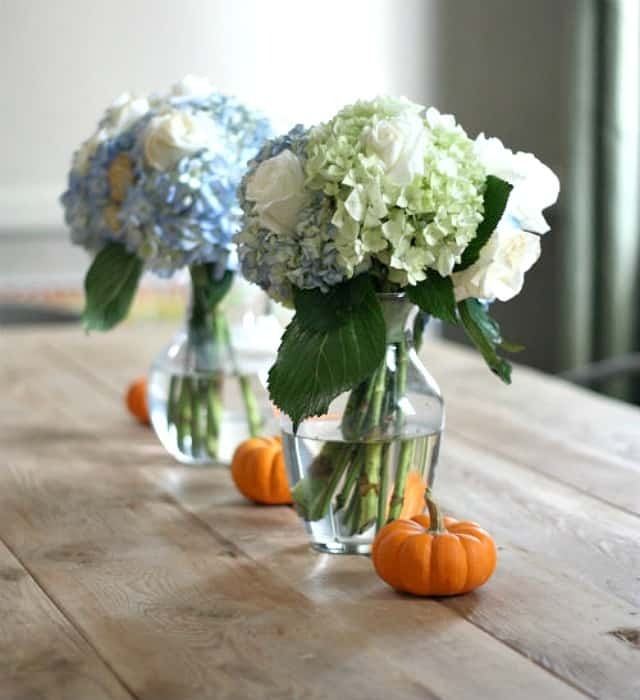 I’ve been thinking about fall decorating for a couple of weeks now, but have been looking for some ways to e-a-s-e into it. Here are 5 ideas to make letting go of summer just a little less painful. 1. Mini pumpkins will start showing up well before the flowers have stopped blooming. Go ahead and mix them in with your summer blooms! 2. Take it slow by just switching out a few pillows with fall’ish colors. 3. 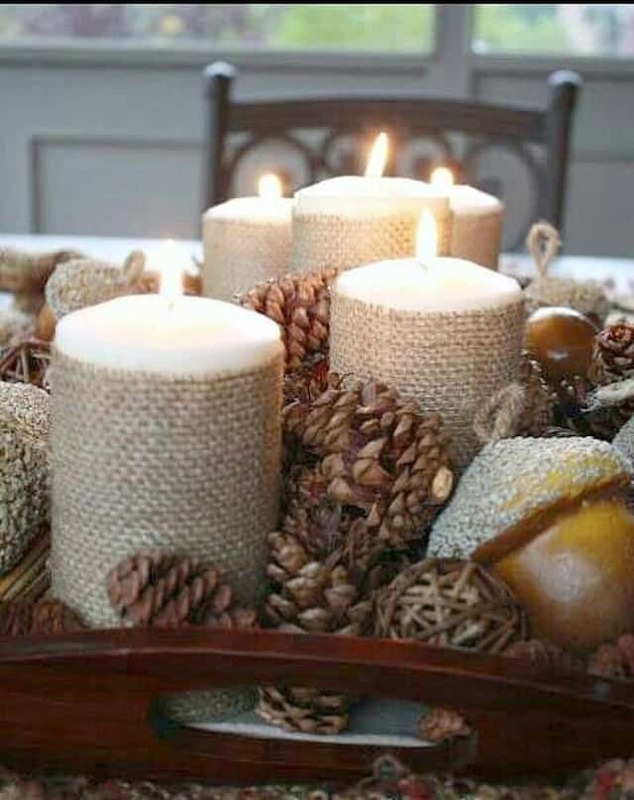 Bring in some fall texture with a simple centerpiece of burlap wrapped candles and pinecones. 4. Bring out a chunky throw. This one is fun and easy to bring out while it’s still summer. 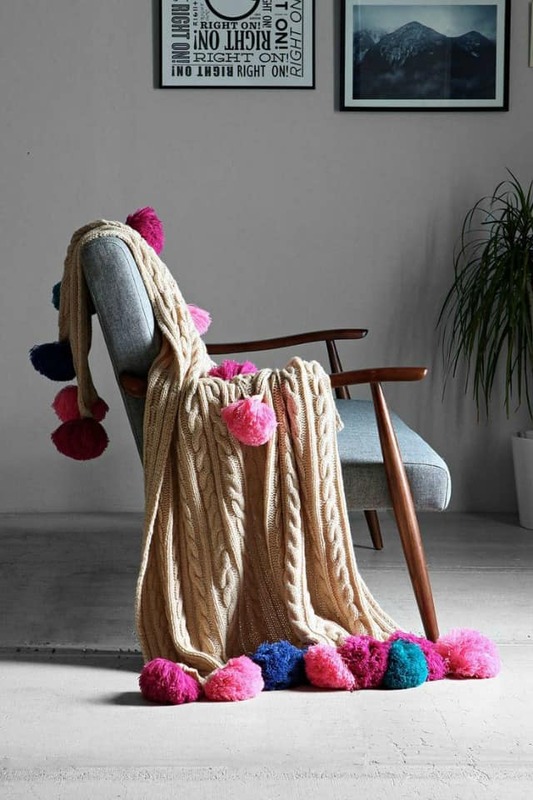 The pompoms are ginormous plus they’re in bright summery colors. 5. Add a colorful quilt to your bed. A quilt with a modern pattern won’t look too heavy during these last weeks of summer. So, how about you? 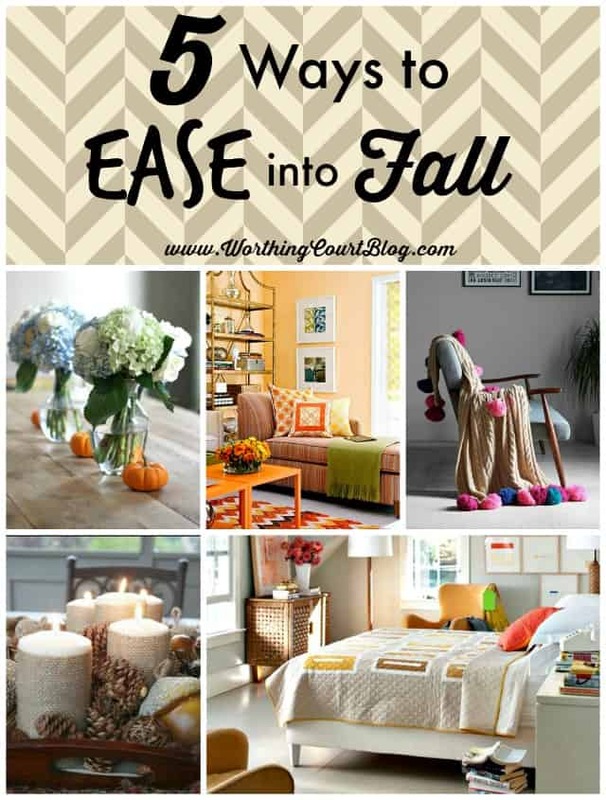 Will you embrace fall with open arms or are you hanging onto summer with all your might? Gotta get me some fall-ish fabric for pillows or see what I might have stashed away! Not quite ready to give up on summer, but thinking fall! I’m caught in between right now with decorating the house. Just finishing up and it is almost time to decorate for fall. My dried lavender is new, so I am struggling with do I put it all out, save it for next spring or summer, etc. I LOVE lavender so I have it in our home all year round! I LOVE lavender too! I vote for putting it out now! I need to catch up on what’s going on with you. I’m so out of touch lately. Great tips, Suzy! I’m ready to start going through my stash. I have no idea what I want to do, though. I just play around with my decor until I get something that speaks to me. But, yes, I’m over summer and this dreadful heat! I’m over the heat too – the older that I get, the more it bothers me. When it’s still hot outside, it’s next to impossible for me to think about fall. I guess the reason that I dread fall is that old man winter is right behind it!